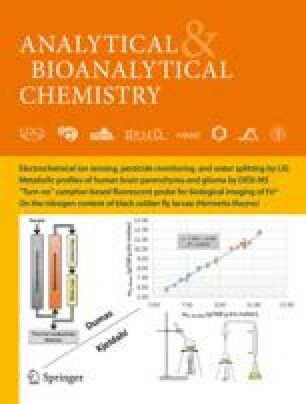 Inductively coupled plasma mass spectrometry (ICP–MS) and isotope-ratio mass spectrometry (IR-MS) have been used to examine the multi-elemental composition and 15N/14N and 13C/12C isotope ratios of three spring barley (Hordeum vulgare) genotypes (Orthega, Barke, and Bartok) grown in three typical Danish agricultural soils (North Jutland, West Jutland, and East Zealand) differing in soil fertility. The aim of the study was to examine whether it was possible to generate a unique elemental fingerprint of individual barley genotypes irrespective of the elemental imprint plants had received from soils differing in fertility and agricultural practice. Multivariate statistics were used to analyze the elemental fingerprints of the barley genotypes at different times during a full growing season from early tillering to full maturity of the barley grains. Initially, 36 elements were analyzed in the plant samples but this number was subsequently reduced to 15 elements: B, Ba, C, Ca, Cu, Fe, K, Mg, Mn, N, Na, P, S, Sr, and Zn. These elements exceeded the limit of detection (LOD) for all genotypes, soil types, and plant growth stages and for these elements the accuracy was better than 90% compared with apple leaf certified reference material (CRM). Principal component analysis (PCA) separated multi-elemental data in accordance with soil type when plants of similar physiological age were compared, whereas this separation disappeared if plants of all ages were compared simultaneously. Isotope ratios (δ15N) of plants also proved to be a highly accurate property for classification of samples according to soil type. In contrast, the differences in δ13C were too small to enable such classification. The differences in δ15N among soils were so pronounced that separation of samples according to the physiological age of plants became redundant. However, δ15N and the multi-elemental analysis revealed no differences between the three barley genotypes, indicating that the influence of soil chemistry and possibly also climate and agricultural practice was too large to allow an unique elemental fingerprint for the genotypes. This finding was substantiated by analyzing the multi-elemental composition of grain from two additional genotypes (Otira and Barthos) grown at the north and east locations, respectively. PCA showed not only that the elemental fingerprints of these two genotypes were similar to those of the others, but also that the soil in which the plant had been growing could be accurately predicted on the basis of the PCA scores from the genotypes Orthega, Barke, and Bartok. Similar conclusions could be drawn using δ15N data. The research was conducted in the Centre for HPLC–ICP–MS Analysis of Trace Metal Speciation in Biological and Environmental Matrices (CHIME; http://www.chime.kvl.dk), supported by grants from the Danish Research Agency (Programme for Expensive Equipment, contract 2017–00–0008), The Danish Agricultural and Veterinary Research Council (contract 53–00–0234), the Strategic Research Fund of The Royal Veterinary and Agricultural University, DK, and The Research Fund to Improve Crop Production, Kemira, DK. Fruitfull discussions with Peter E. Holme and the technical assistance of Bente Broeng and Hanne Nancke-Krogh are gratefully acknowledged.